I had normally planned on presenting my matrix recording from Foxboro, May 1988 as like an anniversary thing. Unfortunately I had to abort the project because the edited files became corrupt. The ghost in the Machine got the best of it. 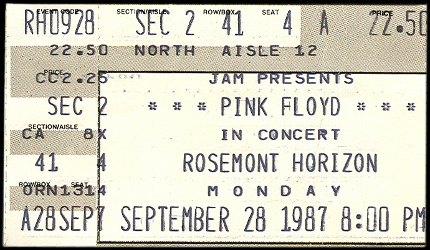 A while back someone handed a copy of a mystery 1987 Floyd gig in hopes that I could identify it and found that it was from Floyd’s last night at the Rosemont Horizon in Chicago, 28th September. This podcast features that recording which I also discovered happens to be taken right from master, all doctored up to sound a little better. This entry was posted in 1987-88 Momentary Lapse of Reason Tour by Doc. Bookmark the permalink. what ever happened to the Foxboro 1988 show? I had to abandon the project.